Venice is one of the most popular and wonderful tourist destination in the world. 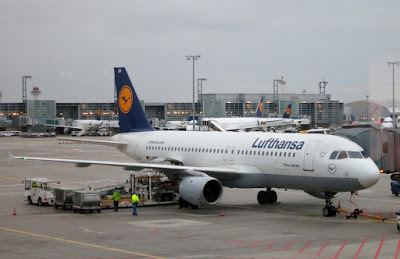 There are direct flights from most major airports into Venice Marco Polo Airport (VCE). Many travelers visit Venice every year because of the many 'must-see' attractions. 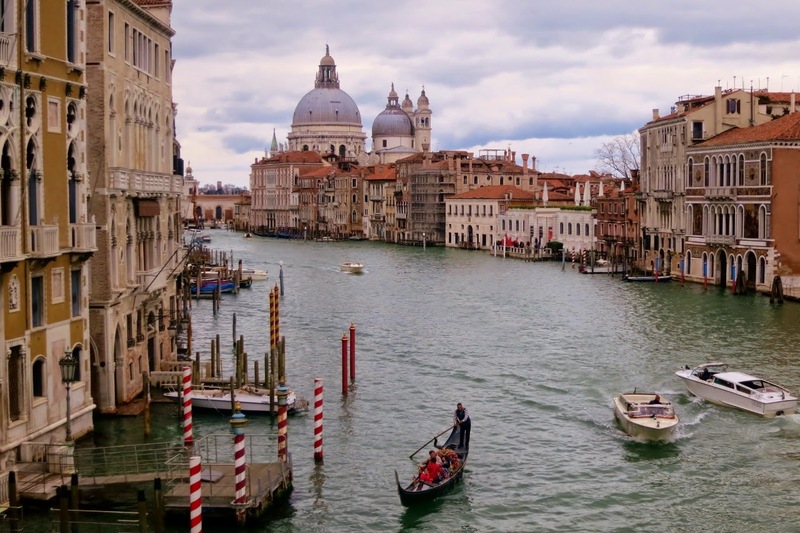 Venice is also a great place for a romantic holiday. 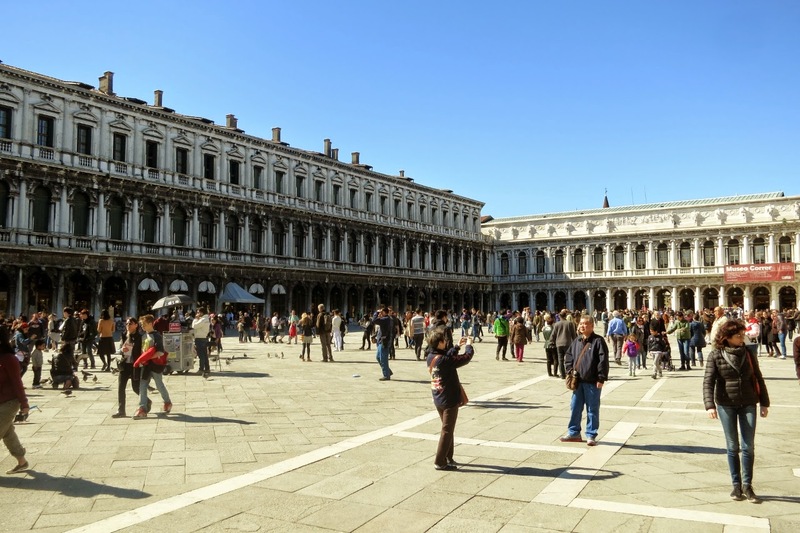 Standing in the middle of the magnificent piazza San Marco is an experience in itself: Napoleon referred to it as the ‘drawing room of Europe’, and today it appears, that many tourists are crammed into this great square. But it’s St Mark’s basilica (Basilica di San Marco), often seen as the living testimony of Venice’s links with Byzantium; Doge’s Palace, once Venice’s political and judicial hub; and Torre dell’Orologio, a clock tower built between 1496 and 1506, that are, not just the square’s, but some of the city’s main attractions. The beauty of the city lies in its narrow alleys, bridges, canals and its elegant architecture. And there are no cars in Venice. Venice is also a cruise ship destination. Plan for three to fours days visit to Venice before or after your cruise. We had chosen to take the trip from the airport to Venice by boat. It makes sense with all the water. Here's bus operations largely taken over by boats, the so called vaporetto. It took about 10 minutes to go from the airport to the harbor, where the Alilaguna blue line departed at 3:15 pm. 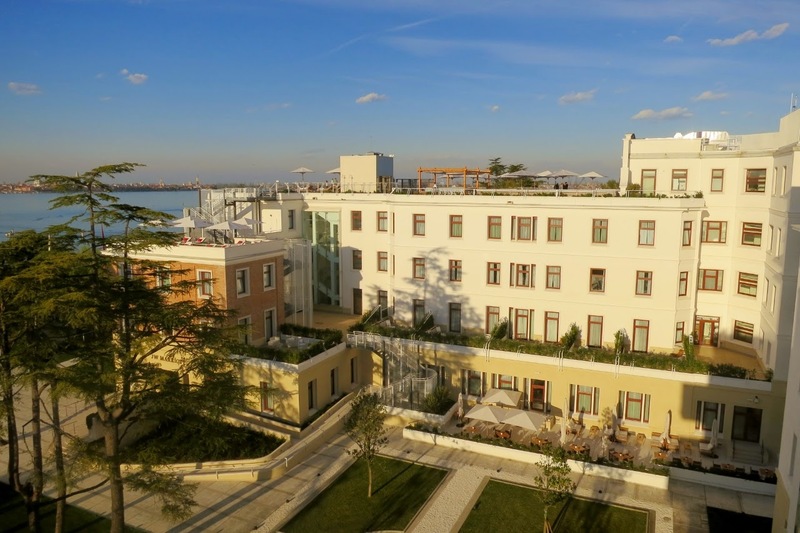 Alilaguna was founded in Venice in 1999 thanks to the business venture of a group of tourist operators who started with the first public transportation service connecting Marco Polo airport to the city centre. First it was the Linea Rossa which connected Marco Polo airport to Murano, the Lido of Venice and San Marco square. Right the year after Linea Rossa was extended up to Zattere and was added also the Linea Blu, connecting Marco Polo airport to Fondamente Nuove, Santa Giustina and San Marco square and the cruise terminal. We arrived at St. Mark's Square at about 4:45 pm and at 5:00 pm the Hotel shuttle boat departed for the Marriott hotel from St. Mark's Square. It took about 20 minutes to sail to the JW Marriott hotel with their private boat. In the background Sola di San Giorgio. Located on the island of Isola delle Rose in Laguna di San Marco. A private island where there is only JW Marriott hotel. Follow my shuttle boat trip from San Marco Square to JW Marriott Venice Resort & Spa, located at Isola delle Rose, JW Marriott Venice Resort and Spa is located on its own private island in Venice, Isola delle Rose, just a 20-minute boat ride across the Lagoon to St. Mark's Square. 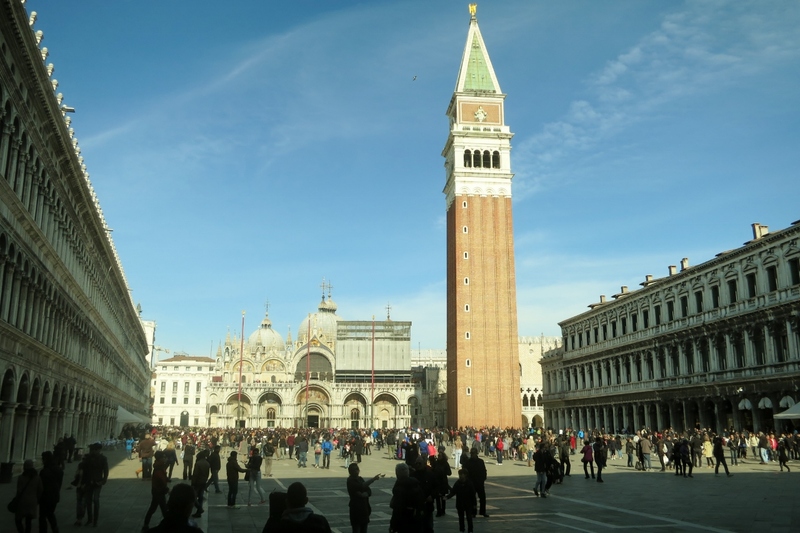 The hotel offers a complimentary shuttle service to and from St. Mark's Square, on a regular basis. 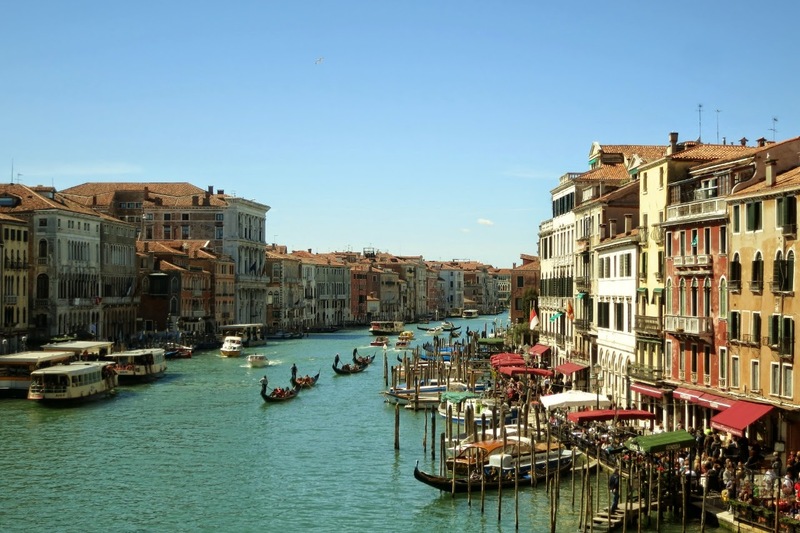 Venice consists of 118 islands, located in the middle of a lagoon in the northwest end of the Adriatic Sea. From the rivers flowing into the sea, released large amounts of silt in the shallow water along the coast, and tidal and ocean current has led to the formation of a series of sand banks around the 51 km long and 14 km wide, serene lagoon. The houses in Venice is built on wooden poles, and in many places, the buildings are no more than one meter above normal sea. The tide in the Mediterranean is weak, but especially at full moon there is a risk of flooding. there can be several centimeters of water at St. Mark's Square, so you put walking boards out. The city has many magnificent palaces, museums and churches which houses paintings by many famous artists. You can stroll around the narrow streets and observe the unusual surroundings. 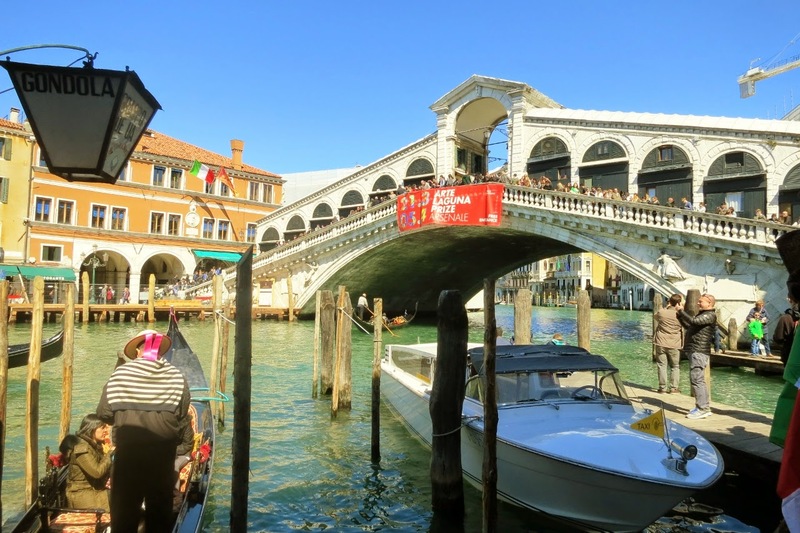 St. Mark's Square and the famous Rialto Bridge, which crosses the Grand Canal - the city's main road - the many gondolas that still floats on water. There are many shops in the city is known for - lace and embroidery from lagune¯en Burano and beautiful crystal and glassware from Murano. The city has many places unusually picturesque. St. Mark's Square with the big church, the bell tower and the beautiful view out over the water, where the sun sparkles on the green lagoon, inspires many artists. 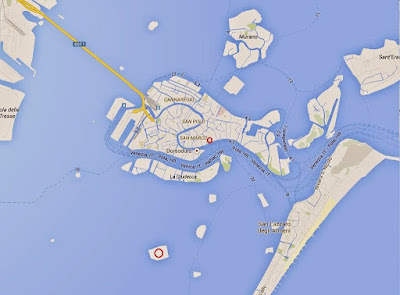 Basically there is three ways to get to Venice from Venice Marco Polo Airport (VCE). Fastes and most expensive is a Water Taxi from the airport. Most convenient and slowest (2 hours) is the Alilaguna Waters Bus from the airport to St Mark’s Square. It’s also possible to take the public bus from airport to Venezia Piazzale Roma (Line 5) and the Waters bus to St Mark’s Square. See the video from my Alilaguna Waters Bus trip. 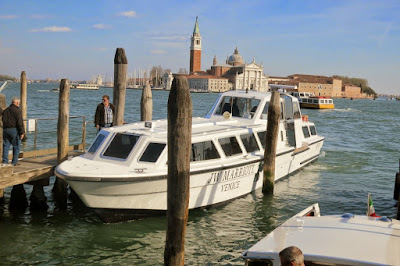 Follow my 1.5 hour water bus trip from Venice Marco Polo airport to San Marco Square, Venice. (can also be used to/from the cruise terminal) with Alilaguna, Linea Blu (Blue line). Alilaguna was founded in Venice in 1999 thanks to the business venture of a group of tourist operators who started with the first public transportation service connecting Marco Polo airport to the city centre. First it was the Linea Rossa which connected Marco Polo airport to Murano, the Lido of Venice and San Marco square. Right the year after Linea Rossa was extended up to Zattere and was added also the Linea Blu, connecting Marco Polo airport to Fondamente Nuove, Santa Giustina and San Marco square and the cruise terminal. 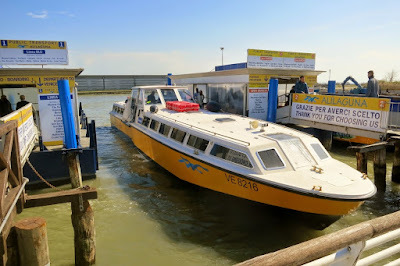 The 1 h 40 min Alilaguna water bus ride from Venice cruise terminal to the Venice Marco Polo airport. Alilaguna waters bus is arriving at the Cruise Terminal in Venice and the tour through Venice. Greek Isles and Turkey cruise with Splendour of the Seas, November 2015. No trip to Venice would be complete without a punt down one of the city’s picturesque waterways in an iconic gondola, www.gondolavenezia.it website has recommended itineraries. 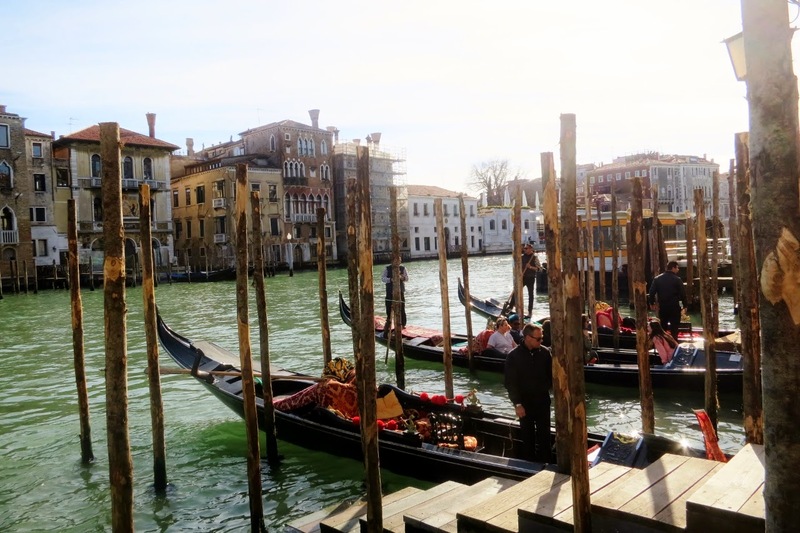 Prices are for the hire of the gondola, for six passengers or less. 8am-7pm €80 for 30 mins and from 7pm-8am €100 for 35 mins. 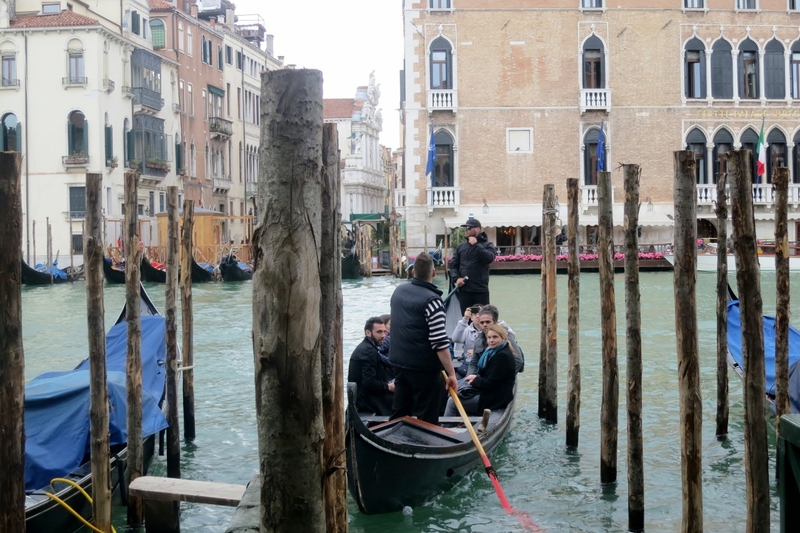 All transport by vaporetto motorboats or by gondola. Below a short video from my Gondola ride at Canal grande and through the narrow canals. 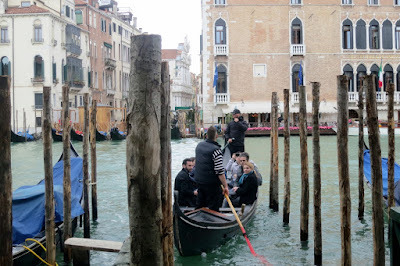 I did not think we could have been in Venice without a trip to the Gondola. 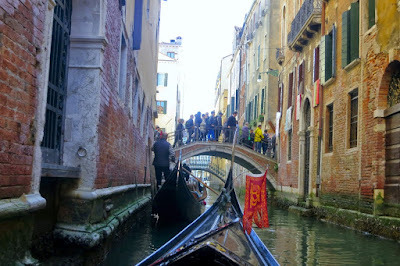 There were 100's of gondolas, and a trip was quite expensive. We had ordered from home to share the cost with several - there may be up to 6 in a gondola, but have not ordered in advance it can be significantly more expensive. At 4:00 pm we were down at the gondola station of San Maria del Giglio, which lie on the Grand Canal. From here came our 30-minute gondola ride.First, we sailed a little down the Grand Canal and then through the very narrow channels.It was an interesting trip. So now we can say that we have been sailing in the gondola. 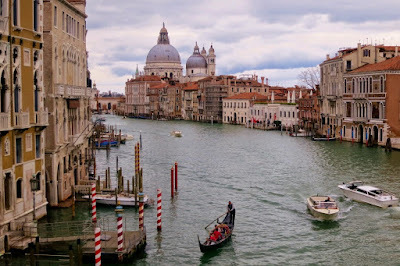 The best way to take in the Grand Canal is on board a vaporetto (Venice’s waterbus). 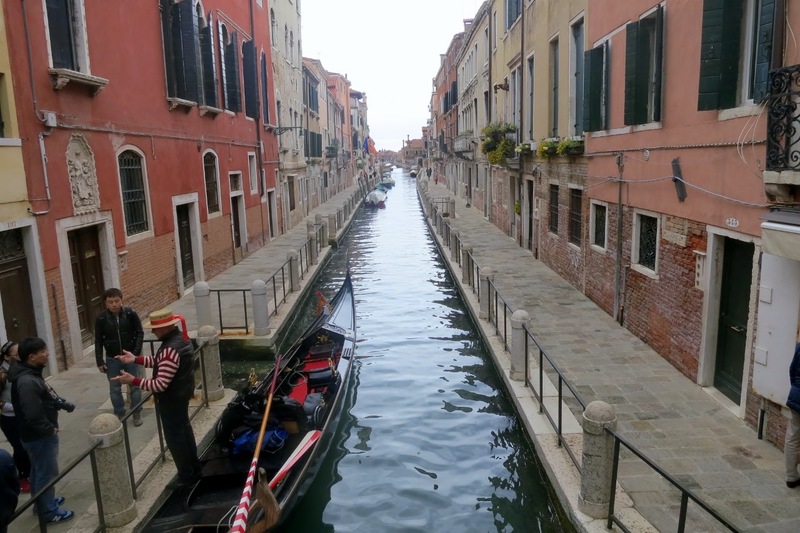 The canal is still the main thoroughfare of Venice. 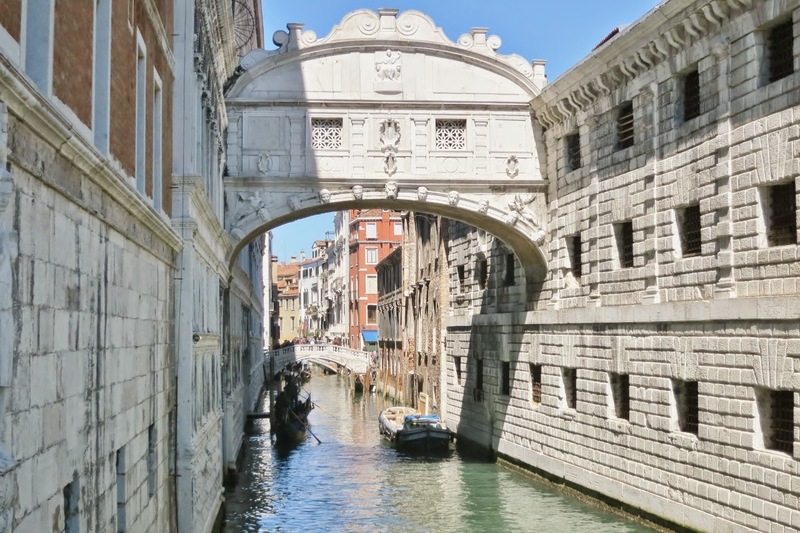 The three and a half kilometre (two-mile) trip from the railway station to San Marco provides a superb introduction to the city, telling you more about the way Venice works. Vaporetto tickets should be purchased before boarding at most stops, or at VeneziaUnica offices . If you board without a ticket at a stop where they aren’t sold, you can buy a single-trip ticket on board. Tickets are for single trips (€7 – valid 60mins on multiple boats), 24hrs (€20), 48hrs (€38), 72hrs (€40) or seven days (€60). 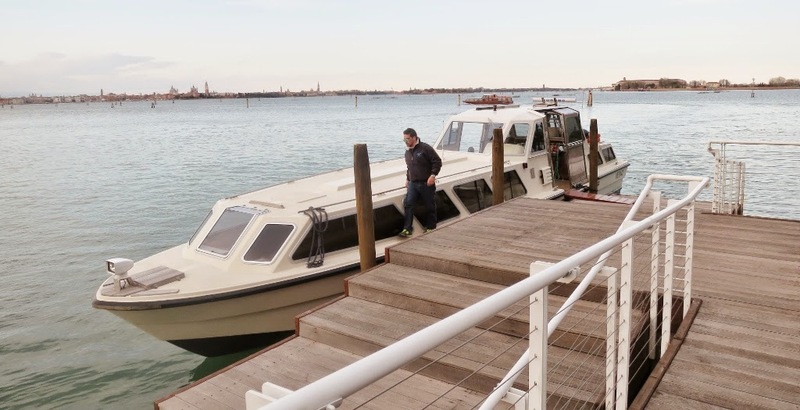 The fare for a shuttle journey (ie one stop across the Grand Canal, the hop across to the Giudecca, or from Sant’Elena to the Lido) is €4. 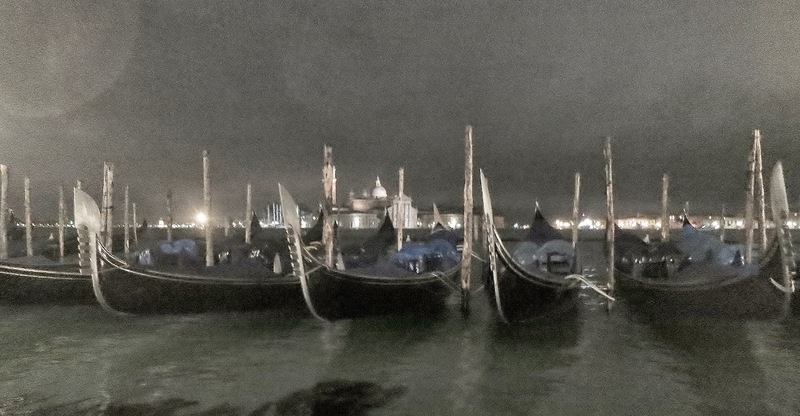 Traghetto means "ferry" in Italian and are large gondolas without bow decoration, brocaded chairs. They are rowed by two oarsmen: one who stands behind the passengers like a traditional gondolier, the other closer to the bow. 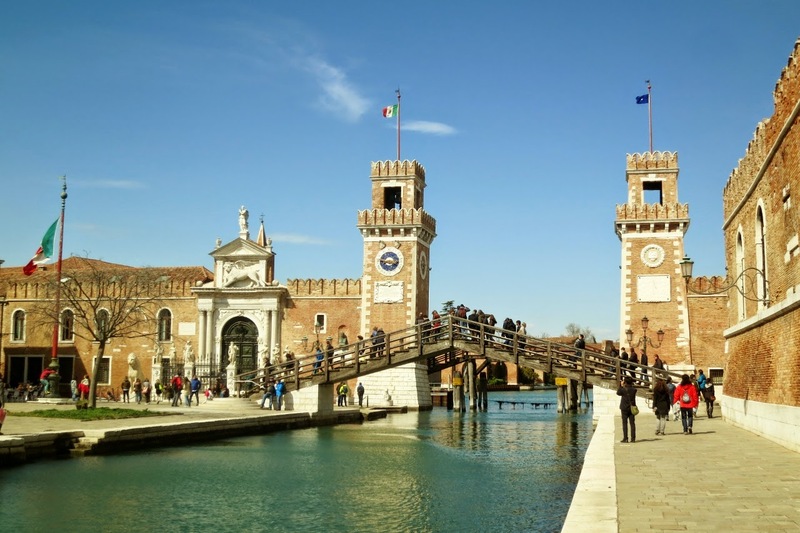 There are only three bridges along the the Grand Canal, therefore there are 7 locatons between the railroad station and St. Mark's Basin, where you can cross the canal in a Traghetto. They are used by locals as a fast route across canal. Locals pay 70 cents while tourists pay 2 EUR (2015). 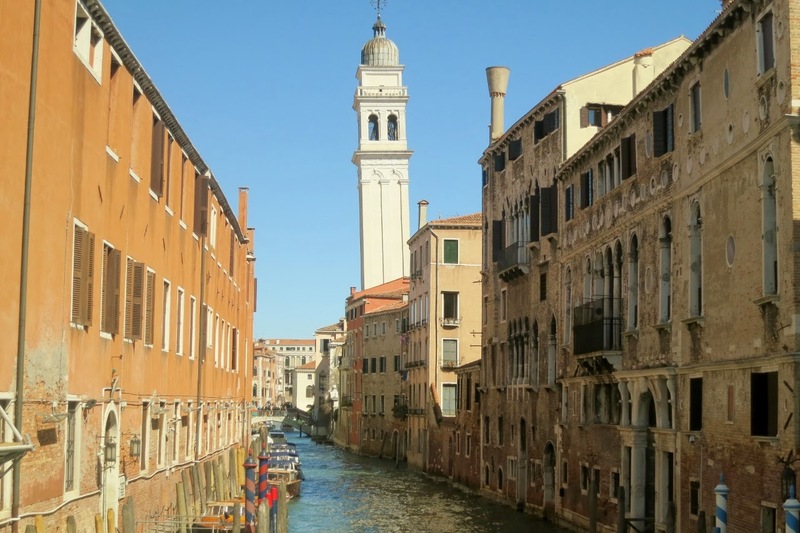 The routes are marked on any good street map of Venice and you will see yellow signs pointing toward the traghetto landings when you are walking along the Canal Grande. At the end of the video you will find a map with the 7 routes marked. After trudging San Marco area thin yesterday was the turn of Dorsoduro and San Polo area to the south-west and west of San Marco. Late in the morning we took the trip in twenty minutes from the hotel of Laguna de San Marco St. Mark's Square. We were going over to the other side of the Grand Canal and chose one of the three bridges Ponte dell'Accademia. 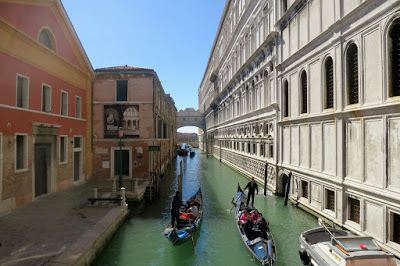 There was a nice view of the Grand Canal. 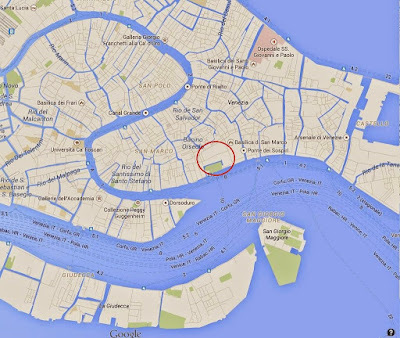 The area east of the Grand Canal is very different from the San Marco area. The channels are wider and the houses are doing. We went down to the tip of the island where the Grand Canal starts - here the huge Virgin Mary Savior's Basilica. We walked along the piers and channels through the area. Time for a light lunch at Cafe before we walked through San Polo very similar to San Marco. Many narrow streets and narrow channels. 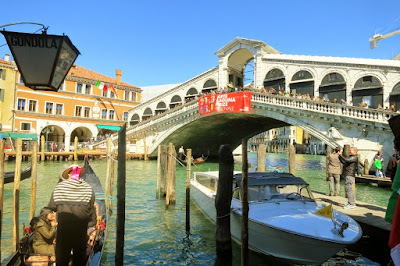 We went back over the Rialto Bridge to San Marco. We had through the hotel booked a table at a restaurant. We decided to go past the restaurant to make sure we could easily finden the evening. On the way back we got a latte and some local cakeLate in the afternoon we took the boat back to the hotel. After a little under two hours at the hotel, we were ready to go back to Venice. We had booked a table at a restaurant for 8:00 pm. At 07:30pm we took the shuttle boat into the St. Marco Square and walked about 8 minutes to the restaurant. Unfortunately, it started to rain. We got a starter with different dumplings, vegetables and fish and a pizza. After dinner we went for a walk through the rain-soaked streets along the canals, St. Marco Square and down to the water. 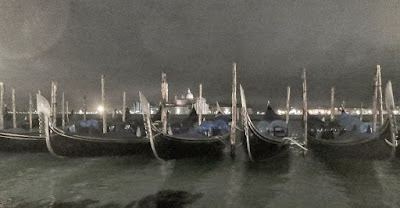 Here lay the gondolas moored for the night with Sola di San Giorgio as a background. 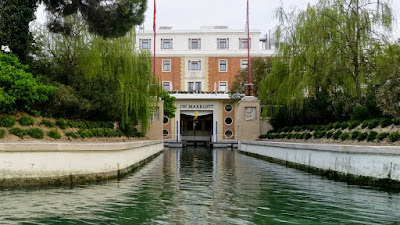 We started the day by walking around to see the Marriott hotel surroundings. We could not get anywhere on the island, as there was some construction. Later we took the shuttle boat to St. Mark's Square. We have a little challenge tomorrow when we go home because we probably can not reach the Alilaguna water bus to the airport at St. Mark's Square, with the first shuttle boat from the Marriott hotel. By going up to the north of the island we can reach the Alilaguna water bus by Ospidale. A walk of about 15 minutes, if we otherwise know the way. One can easily get lost in the mazes of narrow streets. But we found the direct way to the waters bus stop Ospidale. And then it was time to rest at a cafe. We went for a walk in the eastern part of the island, to the Castello area. Here calms among others a fort . We walked around the narrow streets, got a latte at a cafe, and at 4 pm we were ready to go back to the hotel. We got a light evening meal in the bar - first a Manhattan followed by a Club Sandwich and a glass of white wine. Monday was our last day in Venice. 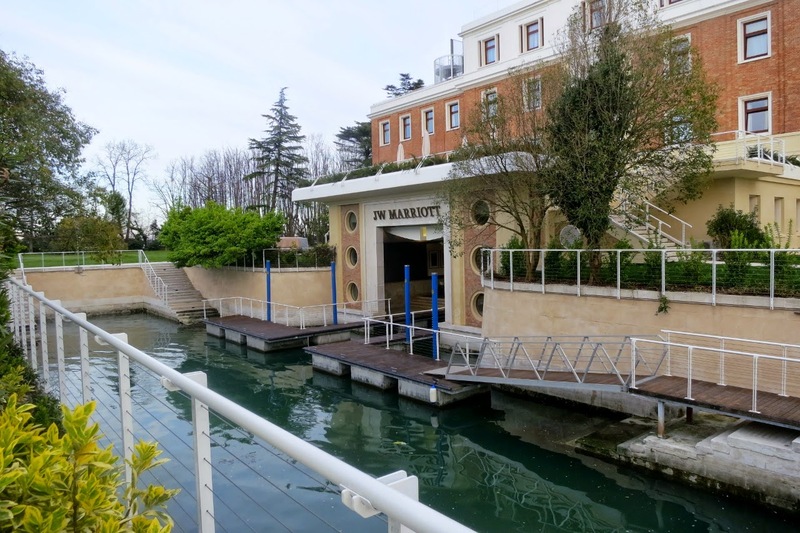 The first shuttle boat sailed from the Marriott hotel to St Mark's Square at 09 :00 am and we would like to reach the water bus from St Mark's Square to the airport at 9:20 am - a little impression is given that we had prepared plan B. As expected, the Alilaguna water bus just sailed as we came in St. Mark's Square. But it takes the Alilaguna water bus about 35 minutes to get around the island with many stops and it took us less than 20 minutes to walk to the water bus stop at Ospidale. We ventured through the narrow streets, and was also encouraging at the stop Ospidale in good time to catch the bus and get the last piece to the airport. It was another day by boat, plane, train and bus before we were home late in the afternoon. An incredibly exciting trip to Venice. Many beautiful churches and palaces, and many interesting things to see. Absolutely recommendable. 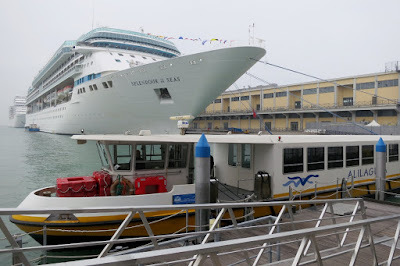 Venice Cruise Sailaway; Splendor of the Seas sailaway from Venice ,November 7, 2015. A short video from our cruise with the Splendour of the Seas - 7 nights 'Greek Isles & Turkey Cruise' from Venice November 7 to 14, 2015. Itinerary: Dubrovnik, Croatia; Rhodes, Greece; Kusadasi (Ephesus), Turkey; Split, Croatia; and back to Venice. Despite the late time of the year, we had a fantastic weather on the trip.